West Palm Beach, Florida, United States: Greg Normanhas been named Vietnam Tourism Ambassador as his golf course design firm serves in an advisory role to create and promote sustainable golf course tourism and development practices in-country. In an on-going effort to promote tourism in Vietnam, the Vietnamese Council of Ministers which includes the Minister of Culture, Sport and Tourism voted unanimously to elect World Golf Hall-of-Fame member and entrepreneur Norman as the Tourism Ambassador. In his role, Norman and his team from Greg Norman Golf Course Design (GNGCD) will contribute to several growth initiatives to be implemented by the Vietnamese Government to expand infrastructure and resort properties into new territories within the country. Norman and his team will advise the Government on how best to utilise golf as a platform for enhancing the growth of international tourism, assist in establishing a comprehensive environmental policy for golf development and maintenance, assist in facilitating relationships with the international governing organisations in golf, the development of new golfers and enhancing the popularity of golf in Vietnam. “I am honoured and privileged to have the opportunity to be a part of the development and success of the emerging golf tourism market in Vietnam and to use what I have learned over 40 years in golf, business and working alongside governments to help build a model of sustainable growth and development,” said Norman. With Norman’s global presence, vast background in golf, business and experience designing and building some of the top resort golf courses in Vietnam and around the world, he was identified by the Ministry as the ideal candidate to help the country capitalise on the influx of international tourists looking to experience first class golf resorts in one of the most unique and visually stunning destinations in the world. “We are very pleased to appoint Greg Norman as the Vietnam Tourism Ambassador for the period of 2018-2021. With future developments in Vietnam underway, golf tourism is relatively new but represents tremendous opportunity for growth in recreational tourism and foreign investment,” said Nguyen Ngoc Thien, Minister of Culture, Sport and Tourism. This appointment comes at a time when Vietnam’s tourism growth is emerging as one of the fastest globally, listed in the Top 10 in the world according to a United Nations World Tourism Organisation Report. The golf tourism market in Vietnam is set to become a billion-dollar industry by 2020. Meanwhile, Norman has been inducted into the Asia Pacific Golf Hall of Fame. The award programme at the Asia Pacific Golf Summit also honoured Greg Norman Golf Course Design as ‘Designer of the Year’ and KN Golf Links Cam Ranh as ‘Best New Course’. Norman spent a substantial amount of his career on Tour in Asia playing in Japan, Hong Kong, Singapore, Malaysia, Thailand, China and Korea throughout the 1970s and 1980s. A Full Business Member of the Asian Golf Industry Federation, GNGCD has a significant footprint in Asia having opened 19 courses with another five currently under construction. 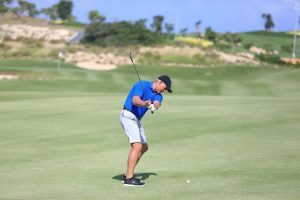 KN Golf Links Cam Ranh celebrated its Grand Opening on October 27 and has already received high praise. Cam Ranh is Norman’s third design in Vietnam with both The Bluffs and Danang included on Golf Digest’s 2018-2019 ‘World’s 100 Greatest’ Rankings (numbers 35 and 94 respectively).